This spring, unlike almost every spring for the past twenty-one years, I missed the commencement exercises at Calvin College. However, I did attend two other graduations, both of them for my sons. My youngest graduated from high school and my middle child graduated from Harvard College. This gave me the opportunity to make some observations about how other schools do commencement, compare that to Calvin’s usual routines, and propose a list of commencement best practices—and not-so-best practices. Choose the right venue. You want full but not crammed. Also, dry and warm. The high school attempted something new this year by holding their exercises in Calvin’s state-of-the-art Van Noord Arena, a gym designed for the sweaty ruckus of college basketball games. This venue works great for Calvin’s commencement, as we fill the place up, but for the high school graduation, it felt cavernous. I’m sure this venue seemed like a great idea at first for the high school event, since it offered an overabundance of seating. The high school office staff was probably high-fiving each other for weeks before, because no one had to tussle with families over how many relatives could attend. But during the ceremony, the graduates felt miles away from the adoring parents—like little be-robed and hatted ants—and we could barely understand the speakers. Meanwhile, Harvard holds their commencement exercises outdoors, rain or shine. This year, there was no shine. So 32,000 damp people negotiated regalia, umbrellas, and uncomfortable folding chairs. My husband and I, in a stroke of boldness and foresight, figured out how to watch via livestream in the comfort of one of the residence houses. Perfect. Strike the right tone. One of the things I appreciated most about Harvard’s commencement was the sense of joy, even playfulness, tempering the formality. There was a lovely sense of humor about the various traditions. For instance, the exercises always open with the Sheriff of Middlesex County slamming a nifty ol’ silver-tipped staff on the dais and calling the “meeting” to order. Then everyone cheers. Honored guests wear top hats and long coats, ladies wear hats. The President sits in a certain rickety antique chair as if it were a throne. Each speaker tips his hat or gives a little bow to the president and honored guests before speaking. No one is straight-faced about this; everyone seems to be loving it, having a great time. I find that Calvin’s commencements are lovely and meaningful, even moving, but no one would accuse us of having fun. I really do appreciate and enjoy them, but we tend to push the “earnest solemnity” button and hold it down the whole time. Same with the high school event: a little too serious. Sure, one of the student speakers was supposed to be funny for four whole minutes, and he was, but that leaves many minutes of earnestness to sit through. Balance the inspire/scold ratio. This is related to tone. Organizers do not have control, I realize, over everything every speaker says. You are going to get some lame jokes and some tiresomely cliche advice. For some reason, speakers also like to scold. At Calvin’s commencements, the scolding is usually quite gentle and along the lines of “be proud, but not too proud because it’s not about you, it’s about God.” Fine. But sometimes graduation scolding can take odds turns, as with one of the high school speakers this year who felt the need to warn graduates for several minutes about the dangers of cell phone use. I actually found that the Harvard speakers, as a whole, got this balance just about perfect. Vice President Joe Biden (who spoke the day before commencement at Class Day), exhorted graduates, with a slightly scoldy tone, to engage in the political process. Grounded as this admonition was in his affectionate warmth, his dramatic life story, his long experience in the political trenches, and the urgency of the current political climate, his words felt invigorating. All the speakers emphasized humility, the responsibility that comes with receiving great opportunities, and a call to service. Quite inspiring. Get a Latin orator. If you can manage to get yourself one of these, I highly recommend it. 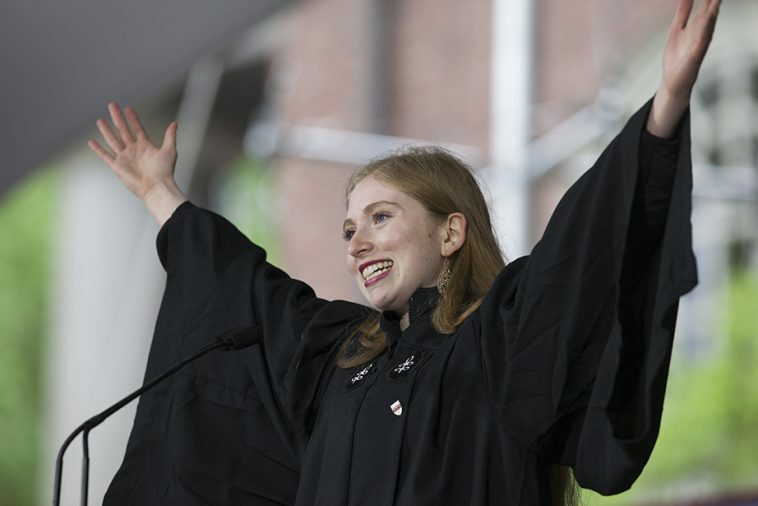 Harvard’s commencement featured a young lady delivering, entirely from memory, a charming five-minute speech, in beautifully poetic Latin, on how the college life resembles ancient epics. It was delightful. You can listen to it here (time index 58:00). To pull this off, of course, you need a video screen with subtitles. Also, you need a viable classics department. Come to think of it, producing an annual Latin orator might be an excellent and sufficient reason to have a classics department. Face the musical challenge. Music is the best tool for striking a joyful tone. Resist the temptation to have an entire crowd sing a ponderous hymn. Do something lively and joyful instead. Have a gospel choir or a jazz band or something with some swing and bounce. Invest in excellent sound technicians. If you have an outdoor event, remember that instrumentalists hate an outdoor gig. They can’t hear each other, the wind blows their music off their stands, and their instruments respond to humidity and temperature changes by souring pathetically out of tune. Unfortunately, Harvard has apparently not figured this out. Just give up on the no applause thing. Oh my goodness, the perennial issue of families cheering when their child’s name is called. Calvin handles this pretty well with the President’s annual admonition that families have come from half way around the world to hear one name, so please hold your applause, etc. The unspoken subtext: we have to zing through 900 names in 45 minutes, so don’t slow us down! Harvard, with some 7000 graduates (undergrad and grad), doesn’t even bother at the big ceremony. They send everyone off to their various graduate schools or residence houses for the graduate-by-graduate name-announcing part, and the families receive the requisite gentle scolding there. At the high school event this year, the assistant principal gave a well-meaning mini-sermon on the importance of hearing each precious name, even invoking baptismal theology, but her admonitions didn’t work at all. In fact, in this case, the whole thing ended up feeling culturally insensitive. For some families’ subcultures, utter silence was precisely not the way to praise God and honor each child. They needed to shout and clap, so that’s exactly what they did. I wonder if we shouldn’t just give up on the “wait till the end” thing and instead make it a challenge: you have exactly one second after the name to give the biggest whoop you can. Go! Consider the grannies. And the grandpas, and anyone with mobility issues. My son’s grandparents attended his high school graduation with us, and it was a bit of an ordeal. A long approach to the door, many steps, not enough hand railings. And afterwards, because a fleet of stupid buses blocked the entire pickup area, waiting to whisk away the graduates to their all-night party, Grandpa had to walk and walk and then stand around and wait to be picked up at a busy intersection. I can’t even imagine having to negotiate Harvard’s commencement events with anyone who wasn’t entirely fit for the occasion. Even my husband and I in our middle-aged good health found all the walking and standing in line and scouting for restrooms a bit of a fitness challenge. Many, many grandparents took on the challenge undaunted, but isn’t there a better way? Assign someone really smart to the problem of crowd flow. It’s tempting to welcome graduates into the “real world” by demonstrating elbow-jabbing, fend-for-yourself crowd crushes before and after the ceremonies. But this is hard on the grannies, small children, and anyone in high heels. I must say, Calvin College manages commencement crowds with seemingly effortless ease. Harvard University most emphatically does not. However: top hats. Did I mention the top hats? They were super cool. All of this is easy for me to say, I realize, since I have never been on a commencement exercise planning committee. And (take note, dear Provost) I have absolutely no desire to be! Please: no! I offer up these observations mostly out of solidarity with all those of us who spent some joyful, perhaps trying, perhaps emotional hours accompanying our beloveds as they stepped through these rites of passage into the future beyond.